A year ago the Xiaomi Mi 5 came out as one of the most beautiful, most powerful and most capable smartphones we have tested. To try and build on that its successor will have a few different versions, aiming to cater to a much wider audience. 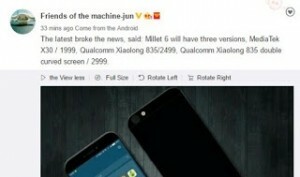 According to Weibo user, the alleged Xiaomi Mi 6, which live pictures popped up months agowill come in three variations with three different prices. The first will be with Helio X30 and will cost CNY1,999 (or about $290), the second device will sport the mighty Snapdragon 835 and will be priced at CNY2499 (approx. $360). The third option will also come with Qualcomm’s latest chipset but will have dual-edge curved display (akin to Samsung Galaxy S7 Edge) and is going to go for CNY2999/$434. The Mi 6 might be officially released at MWC in Barcelona next month. We'll be onsite to report back once Hugo Barra shows it on stage.